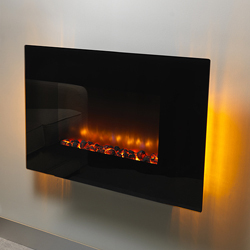 The Orial Robina is a Stylish Flat Black glass fascia front electric fire. 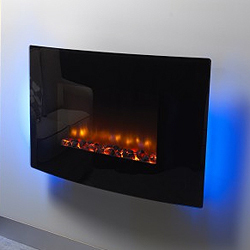 this Orial electric fire is a Glass fronted hang on the wall electric fire. Is Available with a 36 inch width or a 42 inch width also available in a 36inch curved version. Comes with LED back lighting in various colours including, Purple, Orange and Blue as standard. Has Maximum heat output of 2Kw. Also this Orial Robina has a Unique energy efficient LED flame effect. The heat can be Thermostatically controlled. Come with a Remote control as standard. Has Coal fuel effect. Flame effect can be used independently of heat source. Also has a 145mm Slimline outset depth.